Join the members for the third annual Car Show and Vendor Fair. The event will run rain or shine and host LIVE music by Justin Raynor and demonstrations from Mack's Chainsaw Art. Several craft and produce vendors will be on site as well as dozens of antique and specialty cars and trucks. Food booths will be present and the department will host a Chicken BBQ. Fun for the whole family! Proceeds benefit the Webbs Mills VFD. 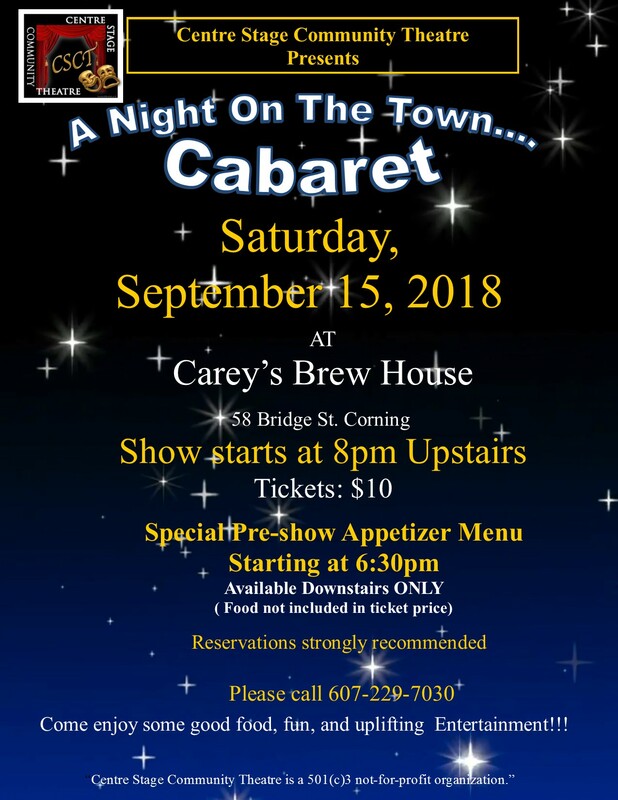 Centre Stage Community Theatre presents: "A Night On the Town..Cabaret", Saturday Sept 15, 2018 at Carey's Brew House, 58 Bridge St. Corning.Carey's will offer a special Pre-Show appetizer menu starting at 6:30pm downstairs. The food is not included in the Show ticket price. The Show starts at 8:00pm upstairs in the banquet room. Our Cast is comprised of local talent from around the area. Everyone has dedicated their time and talent to bring the audience a fine show; full of singing, comedy, skits and even a patriotic tribute. Show tickets are $10.00 per person, general admission. It is directed by Julie Holleran and Assistant directed by Shylah Davies. So come on in and tell all your friends to come and enjoy a night on the town; with good food, fun and uplifting entertainment!! Reservations are strongly recommended. For reservations please contact: Shylah Davies: (607) 229-7030 or Julie Holleran: (607) 215-6688. Join the members for the third annual Car Show and Vendor Fair. The event will run rain or shine and host LIVE music by Justin Raynor and demonstrations from Mack's Chainsaw Art. Several craft and produce vendors will be on site as well as dozens of antique and specialty cars and trucks. Food booths will be present and the department will host a Chicken BBQ. Fun for the whole family! Proceeds benefit the Webbs Mills VFD. The event will run from 11am until 3pm.